Let's go back to 2011, years before Trump announced his presidential campaign. 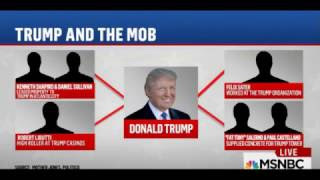 The FBI was granted a court-approved warrant to monitor mafia members running what prosecutors described as an "international money-laundering, sports gambling and extortion ring in Trump Tower," according to an ABC news report. In 2013 when the FBI finally raided the Russians on the 63rd floor, over 30 people were arrested. One of the occupants, a mafia crime boss, Alimzhan Tokhtahounov, managed to escape. Seven months after Tokhahounov's escape he turned up on November 9 in the VIP section of the Miss Universe competition in Moscow. "Do you think Putin will be going to The Miss Universe Pageant in Moscow - if so, will he become my new best friend?" There's no evidence the two met however. Having said that on May 6, Fox News asked Trump whether he had met with Putin while there? He declined to say, though he added: "I got to meet a lot of people." During this time Trump's relationship with Aras Agalarov, a billionaire Russian real estate mogul with ties to Putin, was growing. Agalarov even got Trump to appear in one of the music videos his fame-seeking son Emin was making. Emin Agalarov’s connection to Donald Trump runs through a beauty queen. In 2013 Emin filmed the video for his single “Amor,” in which the young singer pursues Miss Universe 2012, Olivia Culpo, through darkened city streets with a flashlight. Miss Universe representatives later came to Moscow with Culpo to meet with the Agalarovs, and subsequently introduced the Russians to Trump. He seemed to have forgotten that he put Tokhtahounov in the VIP section, and visited with him. I could go on, but I think the case is made for dubious connections with Russian crooks and their government. In the following years, and when he campaigned, Trump continually praised Putin. Trump was right about one thing, the FBI did bug Trump Tower, because international criminals were living there. Did Trump staffers get caught up in the surveillance? Hopefully, one of the four committees looking into this whole mess will turn up the truth.